For many Saint Louisans seeing a Guns N’ Roses concert in the Gateway City after the infamous Riverport Riot of July 2, 1991 seemed implausible. One would probably have better odds winning Powerball than guessing the date, let alone the year, that GnR would perform again in Saint Louis. On Thursday at The Dome at America’s Center the event that many thought impossible became reality with a 3 1/2 hour long performance by the band to kick off the 2nd leg of their “Not In This Lifetime Tour”. As one of the most anticipated shows of the summer, the St. Louis leg of the “Not in This Lifetime Tour” had a lot of people wondering what the band would bring to the city after the disastrous night of the 1991 Riverport Riots, which effectively instituted an animosity towards the band that lasted over 25 years. Rumors and speculation were thrown around by the public months leading up to the concert, with many wondering if St. Louis would see a repeat of that iconic event. While many older fans still hold a grudge over what transpired in 1991 many others, and most younger fans, have let the passage of time heal the wounds and begin a fresh start. Thursday’s concert was that catalyst to a better relationship. Walking into the Dome that night, even I had my doubts about it remaining a peaceful one. The crowd was a large one (about 35,000), with many people already hyped up in anticipation for the night. With all the alcohol being consumed and memories from the past also in attendance, this concert had the potential to be destructive. Fortunately, none of that came to pass. Even notoriously combative rock legends make their peace with time, which just goes to show that all things really do come full circle. Not that the night was without its drama. The closest that the crowd realistically came to rioting was when vendors for the Dome ran out of beer. That’s not an exaggeration, as many of the vending areas did run out of beer during the show. This caused some panic with the already animated crowd, but it quickly became survival of the fittest as the savvier concert goers rushed towards the remaining beer like it was the last lifeboat on the Titanic. Without getting too corny with thoughts on the night, I still want to share that what happened last night was as close to pure magic as many of us get from a performance. Watching and listening to a band as iconic and influential as Guns ‘N Roses, albeit without the completely original crew, was as amazing and memorable as I anticipated. Looking around at the crowd during the performances, I think the rest of the audience felt the same way. 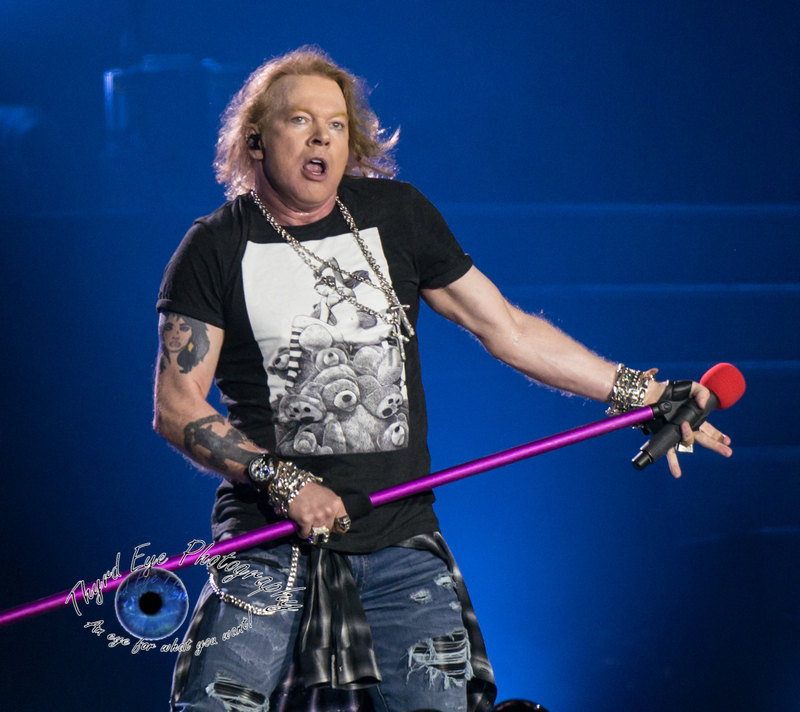 To his credit, Axl Rose put on a spectacular performance that was full of energy and without a hint of mockery. Without addressing the controversial 1991 Riverport Riot directly, Rose nonetheless thanked the large crowd for coming out and ended his final performance by alluding that it would not be long before the band would come back again. The crowd responded to this announcement with enthusiasm and excitement, giving a satisfying conclusion to this tumultuous relationship. All of the band’s members put on a top-quality show, and I want to highlight all the current Guns ‘N Roses crew: Axl Rose, Slash, Duff McKagen, St. Louis’s own Richard Fortus, Dizzy Reed, Frank Ferrer, and Melissa Reese. Each member gave the crowd an incredible performance, something that the audience won’t forget for a long time. It would be a disservice to his performance if I didn’t specifically mention the powerful guitar work from Slash that happened during the entire show. A legendary figure in the rock world, Slash showed us last night why he is one of the great guitar icons. Not overly technical, but showing skill that few can match, Slash played with such heart and pure energy that went beyond showmanship. His performance was about the quality of music and the pureness of the sound, which was something that I wasn’t expecting from a legend in an over-the-top band like Guns ‘N Roses. It was his performances last night that made me realize how one man could turn a grammatical symbol into a word associated with the best of rock ‘n roll. An unexpected, but extremely moving, part of the evening came when the band performed a cover of Soundgarden’s “Black Hole Sun”, which was presumably done in tribute to Chris Cornell. Although it was a slightly ironic moment (after all, grunge did usher in a new type of rock music that pushed bands like Guns ‘N Roses out), it was a beautiful and unique tribute to a rock legend that died too soon. The show was a longer one, with practically 3.5 hours of nonstop playing from the band. If this were any other show, I don’t know if people would have been as receptive to that amount of time. 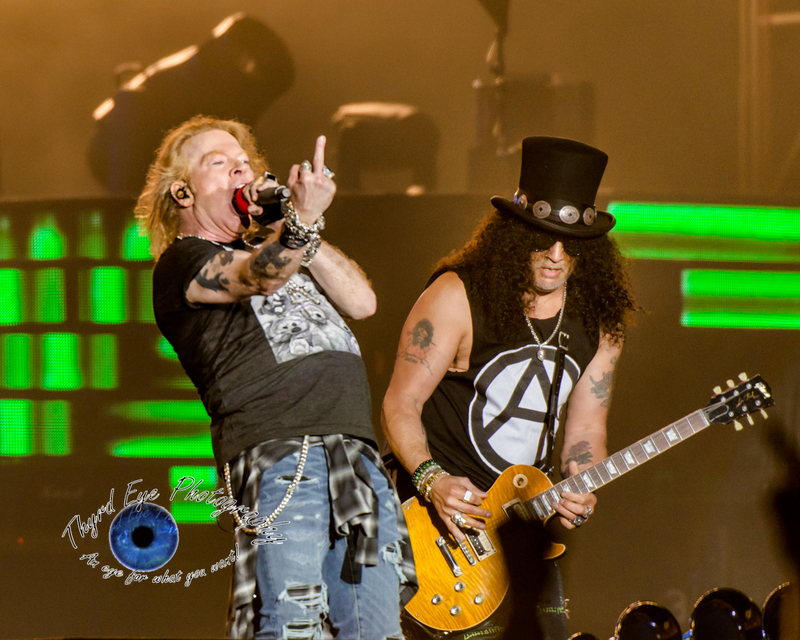 Because this was Guns ‘N Roses and the night was a significant one, the audience kept up the excitement and the elation. It felt like this concert was allowing the past and the present to come full circle and finally be resolved. The night was magical, the playing was spectacular, and St. Louis cannot wait for Guns ‘N Roses to come back to the Gateway City. 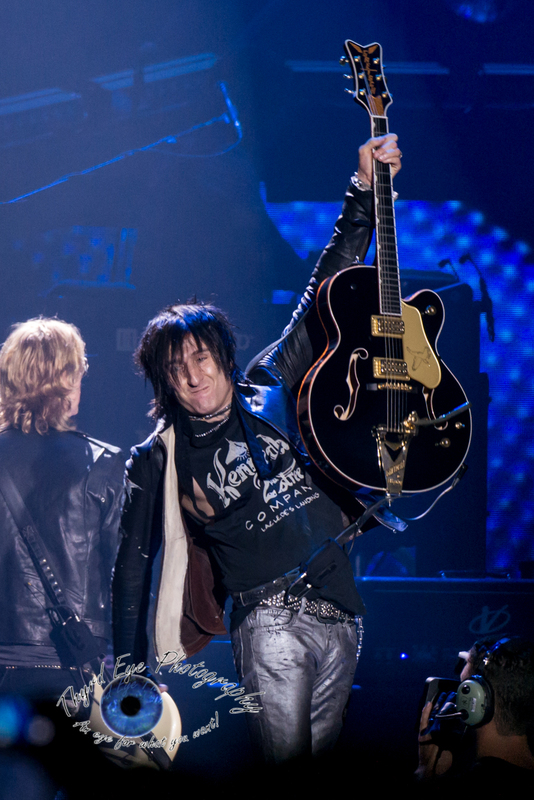 Check out the photo gallery after the Set List. Next: Warped Tour Drew huge Crowds Despite the Heat.